Tomika sat on the couch, knees bent, calves tucked under her. She leaned back and released a sigh as she stared at the object in her palm. Despite numerous scratches, the metal spearhead glinted in the overhead light. Its edges were chipped and worn, but the tip was honed to a point that had nearly gouged Tomika’s hand as she’d pulled the spearhead from the chunk of beetle meat she’d brought home from the market. Most of the scratches were merely evidence of use. All but the name etched in the center of one side. A common name. Too common to mean anything. Except the way it was written… in all capitals, with the “A” made from one fluid stroke so that it looked almost like a star. The same way Mary’s husband Jax wrote the “A” in his own name. Tomika had seen it enough times on Jax’s artwork—carvings done on polished squares of beetle shell—to know it couldn’t be someone else’s writing. Jax was supposed to be dead. So how was there a spearhead with his wife’s name on it sitting in her hand? Beeping snapped Tomika out of her thoughts. She lifted her head and looked at the vidscreen on the far wall. The name “X. Chambers” flashed in the corner of the screen. Tomika tapped her finger against her leg. If she didn’t answer, Xavia would just keep calling. She leaned forward and dropped the spearhead into the basket sitting on the coffee table so it wouldn’t be visible to the camera, then sat back up. Xavia’s image appeared on the vidscreen. “Tomi, why haven’t you called? I thought we were meeting for lunch today.” She sat cross-legged in a hoverchair, a gold anklet flashing reflected light as she tapped her foot against nothing. Jax was alive, and bug hunting. Which meant his death had been faked. It was the only explanation. Why hadn’t she seen it before? Jax was the first to be arrested, and then every last “business partner” of his gets busted. He must have made a deal. A deal that meant banishment from the station to the planet below—leaving Mary with three kids to care for, and another on the way, all thinking he was dead. Tomika didn’t know how the girl had handled it. Tomika jumped up from the couch and plucked the spearhead out of the basket. She grabbed a towel from the kitchen, carefully wrapped the spearhead, and slipped it into her bag. Tomika’s footsteps echoed off the metal walls of the curved corridor. The electric hum of Avenir’s core didn’t travel to Tomika’s upper level, but she could detect it faintly here on Mary’s. She stopped and placed her thumb on the scanner by Mary’s door. Her heart pounded, and she fidgeted with the silver ring on her right hand while she waited for Mary to answer. The door slid open. Mary stood in the entryway, a sleeping newborn in her arms. “No, it’s fine. Come on in. Jacey will be sleeping for a while.” Mary stepped back to make room for Tomika to enter. Tomika followed her inside, the door sliding shut behind them. They took seats in hoverchairs facing each other. Mary began to rock hers. Tomika stared at Mary. The unfinished sentence…the night he…echoed in her mind. Would that last word have been “died”—or something else? Disappeared. Left. Did Mary know the truth? Was she simply upset that Jax was sent away before she had a chance to tell him, or did she really believe him to be dead? Tomika struggled for a way to find out. It had been a few months since she’d last seen Mary, their friendship decaying in the wake of all Mary was going through. Tomika’s own life had gone on as usual, and the rift that formed between them seemed impossible to repair. Her mind refocused on the spearhead in her bag. “I bet that would make him happy to hear,” Tomika said. They talked about everything, including Jax, but the conversation never took a turn toward anything Tomika could use. Still, their hoverchairs eased closer as they continued to talk, and the rift in their friendship seemed to shrink as well. Soon, Tomika’s chair was touching Mary’s, and she stared down into Jacey’s face. Mary shifted her chair around to face Tomika and eased Jacey into Tomika’s arms. The baby’s head lay in the crook of Tomika’s elbow. So small, so soft. Innocent. Jax had not been innocent, but apparently he’d done the right thing in the end. Tomika wondered how Mary felt, either way. If Mary knew Jax was still alive, did it make her angry that he’d given up his family? Tomika mustered her resolve. She needed to find out…but how? She looked at Mary, who’d leaned back in her chair and crossed her legs. Mary’s eyes fought to stay open. Tomika nodded. Mary slipped out the hoverchair and smiled down at Jacey before disappearing into the bedroom. As soon as the door slid shut behind Mary, Tomika stood. Jacey nestled securely in her arms, Tomika walked through the living area and scanned for anything lying around that might clue her in to what Mary knew. The apartment was neat, with just enough mess to show that kids made their home here. A stray toy lay on the floor, and the outer wall was smudged with little fingerprints. Tomika stepped in front of the wide porthole on the far wall of the main living area. 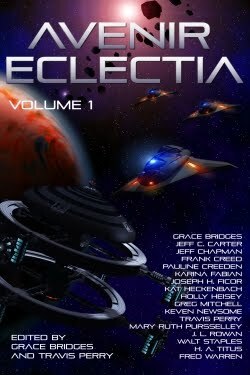 Stars twinkled through the misty glow of red light that reflected from Eclectia, although the planet itself wasn’t visible from this side of the station. She walked toward a desk that hugged the wall next to Mary’s bedroom door. Sleek squares were stacked on top—but as Tomika reached the desk she saw that they were carvings made not by Jax, but Mary’s children. She let out a sigh and leaned against the wall. Jacey wiggled in her arms, smacked her tiny lips, but didn’t wake. A muffled noise carried through the wall. Tomika pressed her ear against the hard, polymer structure and listened. She bit her lip and closed her eyes. Tears burned behind her lids. She eased one hand out from under Jacey, shifting the baby’s weight so she stayed secure, and reached up to wipe the tears away. Her elbow bumped something sticking out from the wall, and Mary’s sobs came louder and more clearly. Tomika opened her eyes, stifling a gasp, and looked at the button she’d hit with her elbow. Of course, the intercom. She reached out to turn it off, but her hand stopped mid-way when she heard Mary say Jax’s name. It came out muffled, but this time as if her face were pushed into her pillow. Tomika held her breath, hand still poised in mid-air. Tomika swallowed and then snapped the intercom off. Jacey began to squirm in her arms, and Tomika turned and walked back to the hoverchair, where she sat and rocked until Jacey settled down. Mary bobbed her head in a slight nod. “Thanks.” She turned and walked toward the children’s room. The sound of Mary’s footsteps told Tomika she was far from the open door. Tomika crept into Mary’s bedroom, where she pulled out the spearhead and unwrapped it from the towel. She set the spearhead on Mary’s nightstand. With that, she left Mary’s and headed back to her life. But today had changed everything.